Pawan Tiwari; an ardent communist has lost faith in his surrounding world. A condolence draft about himself enables him to take off in search the other world. While; Suman is in love with her female counterpart Chahana whose recent murder in the shabby streets of Kathmandu is taking time to render. As both desperately seek identity and a space that defines their existence; Lalteen takes shape. Produced by Harke Films for Short Film Factory, Lalteen is Factories first project and aims a premiere showcase at the Nepal Cine Symposium in November. Lalteen is an amalgam structure feature film that sees two independent film structures directed by Kshitiz Adhiraj and Abinash Shah respectively take on a single form as the two thematically merge. 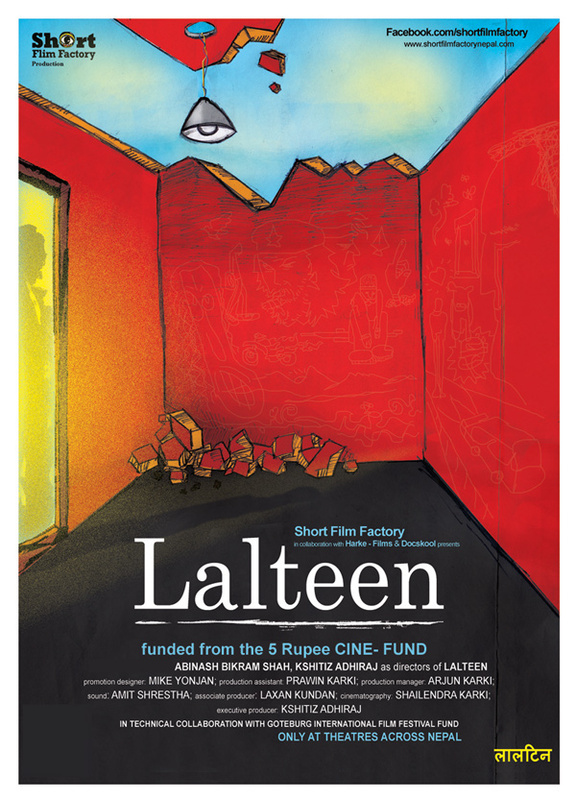 Lalteen, is the first of six films that Short Film Factory has plans to produce between 2010 and 2014, all of which are targeted at promoting discourses on cinema as an art form. Short Film Factory was initiated as a specific film fund project of Docskool in 2010; facilitated and funded in principal by Harke Films,a production company overseen by filmmaker Kshitiz Adhiraj.The Lalteen project has also been supported by The Goteborg International Film Festival Fund through a seed grant to Docskool. Goteborg Film Festival is considered one of the strongest film funds in the world, while the festival has a very strong Scandinavian presence. Lalteen is expected to make a festival presence at theGoteborg Film Festival later in 2012. Short Film Factory works as an openly accessibly fund base that supports young filmmakers under the age of 30 who are currently working on their first feature films. Unlike the name, SFF is not involved in funding short films. The fund opens applications once ‘ twice a year and supports are provided as production grants with up to 5,000 USD in offer as the latest arrangements. In 2010, SFF started the SFF 5 rupee cine fund; a venture concept that enables common masses to be involved in the co-production of films. Lalteen is the first of films being funded by mass collection of co-production funds.